Agriculture is a key sector in India and it employs around 52% of our population. The Ministry of Agriculture and Farmers Welfare implements the rules, regulations, and laws related to the agricultural sector in India. The department’s ambit covers agriculture, food processing, and cooperation. 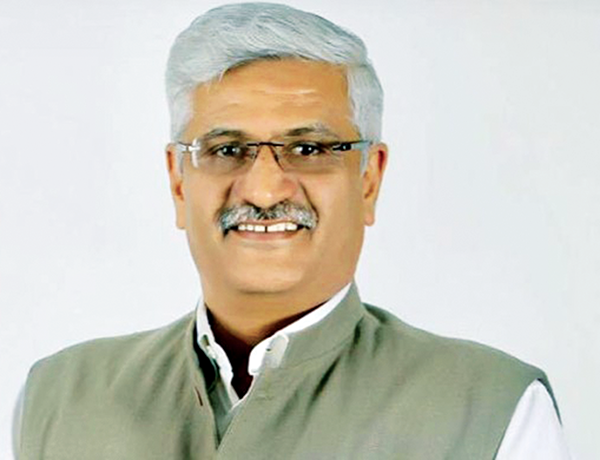 BE’s Madhu Raina spoke to Gajendra Singh Shekhawat, Minister of State for Ministry of Agriculture and Farmers Welfare on the agricultural sector and his department’s policies related to the sector. Q. Some reports suggest that India is one of the top countries for the losses of agricultural commodities in the post-harvest situation. Is it true? Is the government taking any action to reduce such losses? A. According to a report in 2015 on “Assessment of Quantitative Harvest and Post-Harvest Losses of Major Crops and Commodities in India” prepared by Central Institute of Post-Harvest Engineering and Technology (CIPHET), the harvest and post-harvest losses for agriculture commodities range from 4.65-5.99% for cereals, 6.36-8.41% for pulses, 3.08-9.96% for oilseeds, 6.7-15.88% for fruits and 4.58-12.44% for vegetables. The total estimated economic value of quantitative loss was found to the tune of `92,651 crore in reference to the average annual prices of 2014. There are no authentic data available on global ranking of India as one of the top countries in terms of post-harvest losses of agricultural commodities. Mission for Integrated Development of Horticulture (MIDH), Rashtriya Krishi Vikas Yojana (RKVY), sub-schemes of Agricultural Marketing Infrastructure (AMI), and Venture Capital Assistance (VCA) under Integrated Scheme of Agricultural Marketing (ISAM) as well as Pradhan Mantri Kisan SAMPADA Yojana (Scheme for Agro-Marine Processing and Development of Agro-Processing Clusters) also aims at promoting post-harvest and marketing infrastructure in the country. Further, the Indian Council of Agricultural Research (ICAR) is carrying out research and development activities towards development of machines, tools and technologies for scientific storage, post-harvest processing and development of value chain for agricultural commodities so as to minimise losses. In addition, programmes relating to capacity building in value chain and development in post-harvest engineering and technology by Krishi Vigyan Kendras (KVKs) and CCS National Institute of Agricultural Marketing (CCS NIAM), Jaipur are also aimed at reducing the post-harvest losses. Q. Has the year 2016-17 been a record as far as production of pulses is concerned? Will the prices of pulses come down in 2017-18? A. As per the 4th Advance Estimates, the total production of pulses during 2016-17 is estimated at around 22.95 million tonnes, which is higher by 3.70 million tonnes than the previous record production of 19.25 million tonnes achieved during 2013-14. The pulses production during 2016-17 is also higher by 6.61 million tonnes than the production of 16.35 million tonnes during 2015-16. The yield of pulses in the country increased over the years from 577 kg/ha in 2004-05 to 779 kg/ha in 2016-17 according to 4th Advance Estimates. Given the vast differences in the levels across countries in the production, consumption, varieties of pulses, climatic conditions, irrigation intensity and size of the farms, yields of countries of the broad group of pulses are not strictly comparable. As against a global average yield of pulses of 909 kg/ha in 2014, India’s yield was 764 kg/ha in 2013-14. All India average wholesale prices of pulses broadly exhibit a decline from January, 2017 to November, 2017. Q. The Bundelkhand region is adversely affected by consistent drought and non-availability of climate resilient crops. This has caused irreparable setback to agricultural activities in the region. Is the government having any plan to revive the agricultural sector in Bundelkhand? A: We are aware of the situation of Bundelkhand and have provided special packages. The Indian government has evolved several schemes and programmes to address the need for drought mitigation and address other requirements of the farmers under Rashtriya Krishi Vikas Yojana (RKVY), Pradhan Mantri Krishi Sinchayee Yojana (PMKSY), besides the implementation of Pradhan Mantri Fasal Bima Yojana (PMFBY) and National Agriculture Market Scheme (e-NAM), etc. for protecting farmer’s interests. The states have been given flexibility under RKVY to plan region specific interventions for the farmers. Q. The crash in prices of agricultural output and the rise in cost of agricultural input have adversely affected the interests of all sections among the peasantry. Has the government taken any concrete steps in this regard? A. Market prices of agricultural commodities periodically exhibit seasonal and cyclical variations due to demand-supply mismatches. To mitigate the risk of volatile market prices, the government fixes the minimum support prices (MSPs) of principal crops and conducts procurement operations. The MSPs take into account all paid out costs and costs of family labour and seek to offer adequate returns over weighted average cost. One way to look at the relative movements in the prices received by the farmer and the prices for inputs paid is to analyse the Index of Terms of Trade (ITT) for agricultural sector and farmers. The agriculture sector index which includes farmers and labourers has remained favourable till 2016-17 while the ITT for farmers has remained unfavourable till 2015-16 but turned out to be favourable in 2016-17. For the perishable and horticultural commodities for which MSPs are not fixed, in order to protect the growers from distress sales, the government implements the Market Intervention Scheme (MIS) whereby procurement is made on the request of state government. Q. What is the policy for fixing the Minimum Support Price for agricultural produces? A. The government fixes MSPs for agricultural produce on the basis of the recommendations of the Commission for Agricultural Costs and Prices (CACP), after obtaining the views of state governments and central ministries and departments and other relevant factors. While recommending MSPs, CACP takes into account the cost of production, overall demand-supply conditions, domestic and international prices, inter-crop price parity, terms of trade between agricultural and non-agricultural sectors, the likely effect on the rest of the economy, besides ensuring rational utilisation of productive resources like land and water. CACP also holds consultations with various stakeholders including state governments and farmers’ representatives before finalising its recommendations. The committee constituted in 2013 by the government under the Chairmanship of Prof. Ramesh Chand, the then Director, National Institute of Agricultural Economics and Policy and presently Member of NITI Aayog with a view to examining the methodological issues in fixing MSP had submitted its report. One of the Terms of Reference (ToR) of the committee was to examine the cost concepts for the purpose of fixing Minimum Support Prices and suggest various factors for improvement so as to make it more realistic. The report has been examined and a number of meetings have already been held with the various ministries and departments. The government has not taken any decision on the implementation of the recommendation of the committee so far. Q. Is the government aware of rising prices of onion and tomato in the domestic market? The consumers are purchasing onion at exorbitant price and on the other hand farmers are not getting a remunerative price for onions. Are any steps being taken by the government to provide remunerative prices to onion and tomato farmers and make them available at a reasonable price in the market? A. The prices of onion and tomato are closely monitored and there has been a raise in prices. However, the production of these commodities in the country is sufficient to meet the domestic demand. Price of perishable agricultural items like onion and tomato may increase and decrease due various reasons such as production, crop seasonality, unfavourable weather conditions, transportation cost, grading / sorting, wastage during movement etc. The following steps have been taken by the government to provide remunerative prices of onion and tomato farmers and stabilize the prices in the market. 1. Ministry of Agriculture and Farmers Welfare has approved the proposals of procurement of 6,51,000 Metric tonnes of (MT) onion in Madhya Pradesh and 20,000 MT in Rajasthan in view of the request received from the respective state governments. No such proposal from state governments for tomato procurement has been received. 2. Under Mission for Integrated Development of Horticulture (MIDH) scheme, farmers are mobilized into Farmer Producer Organization (FPOs) for aggregating and for ensuring economies of scale. Efforts are being made to link FPOs to market by way of direct marketing farmer consumer markets / Apni Mandi and e-markets. 3. Under MIDH, assistance is also provided for development of post-harvest management and marketing infrastructure such as cold storage, cold room, packing & grading houses, reefer vehicle, primary and wholesale market etc. 5. The onion procured by government is being retailed through SAFAL, NCCF and also through auction in mandis so as to improve availability and moderate prices. 6. Under National Agriculture Market (e-NAM) scheme, there is a target to integrate 585 mandis across the country by March, 2018. The scheme aims to create a national web based unified agri-marketing portal for inter market and inter-state trading of agri-produces. As on December 14, 2017, 470 markets across 14 states/UTs are integrated with e-NAM portal. 7. The government has released a new model “The Agricultural Produce and Livestock Marketing (Promotion & Facilitation) Act, 2017” on April 24, 2017 for its adoption by the states. The provisions include setting up of private markets, direct marketing, farmer-consumer markets, special commodity markets, etc. so as to reduce the number of intermediaries between producer and buyer and increase the share of the farmer in consumer’s rupee. 8. The government has also extended the stock limit on onion up to December, 31 2017, to check hoarding of this commodity.